Everyone loves looking out through a clean and sparkling window. Sparkly windows add to the curb appeal of your home but very few of us love to be tied to the tedious and boring task of cleaning windows. You probably do not have the time required to work on your house windows or you are simply afraid of undertaking the perceptibly risky chore. Our cleaning company has assembled a team that will lay all your fears to rest and give you windows that sparkle as much as the morning sunlight. Our window cleaners will transform your windows into the envy of the apartment block. To place your order, simply give us a call or fill the online order form. We have an elite team that is fully covered by employee compensation insurance policies, and we will be glad to forward you the insurance certificates upon request. One of the most frequent questions we get from new clients is how equipped we are to clean stories windows. 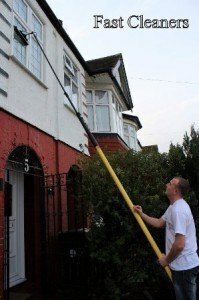 We use high-access window cleaning poles to reach every window in your house and ensure that they are sparkling clean. By combining the conventional squeegee and the reach and wash pure water system, we ensure that no window in your house remains unwashed. At Fast Cleaners Lewisham, our guarantee to you is to offer more than just cleaning services. We deliver timeliness and reliability. We also guarantee your satisfaction and we have a pledge to honour all of our client’s requests. Call today on 020 3322 8493 and avail from our discounted cleaning prices.